(Southern Living) -- When I was 5, my parents went to a conference on Hilton Head Island and let me tag along, leaving my brothers landlocked in central Mississippi. Two memories stand out from my first encounter with the watery majesty of this Southern icon. 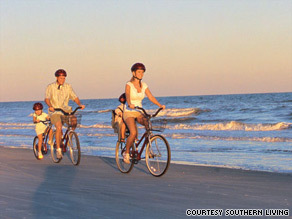 Hilton Head Island's relaxed atmosphere is ideal for families. For starters, it's the first place I ever heard the term "market price." Daddy encouraged me to eat whatever I wanted at restaurants -- no kid's menu here -- so I tried my hand at swordfish. I figured anything so fresh they couldn't put a price on it until the day it was served had to be good. And for years, I ordered based on that idea. From the right side of the menu. If it was fresh (and expensive), it had to be the best. Second, water was everywhere. I'd been to the beach before, but never an actual island. It seemed like Hilton Head had more boats than my hometown had cars. And even then, I understood that the marinas were the real lifeblood of the community. While there: Hard-bottomed Zodiac boats crouch closer to the water than a traditional boat does. We booked a one-hour tour with H2O Sports (www.h2osportsonline.com or  671-4386) and spent the afternoon watching dolphins play. While there: Rain or shine, locals and tourists mingle in the late afternoon over heavy-handed cocktails; ice-cold brews; and steaming, hot-boiled shrimp at the open-air Salty Dog Café (www.saltydog.com or  363-2198). Arrive early and snag a table; they tend to fill up quickly. With a working boatyard and a everyone-knows-your-name dockside bar (Captain Woody's), Palmetto Bay gives off a relaxed vibe that transcends labels such as "local" and "tourist." Our group settled onto the patio at Black Marlin Bayside Grill for brunch -- a perfect place to dawdle on a lazy morning ( 785-4950). My personal favorite: the shrimp hash -- a hearty combo of poached eggs, delicate shrimp and spicy sausage -- is like something you'd expect for breakfast on board a fishing boat. My brother bogarted the sushi nachos with seared tuna and avocado. And the sisters-in-law did serious damage to the dessert-like bananas Foster French toast. Local fish and shrimpboats unload their nets along the piers at Skull Creek, where a trio of restaurants, all with waterside dining, take advantage of the seasonal catch. Hudson's On The Docks (www.hudsonsonthedocks.com or  681-2772) is a perennial crowd-pleaser with down-home seafood platters. Charley's Crab (http://www.muer.com/ or  342-9066), a khakis-and-button-down kind of place, delivers she-crab soup and fried green tomatoes with a shrimp-and-crawfish salsa. Copyright 2009 Southern Living magazine. All rights reserved.